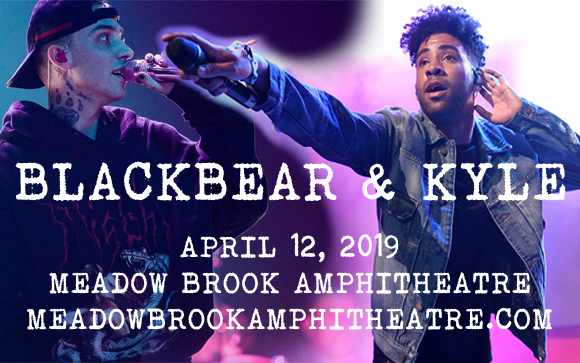 Blackbear and Kyle are teaming up for a very special, one-night-only show, coming to Meadow Brook Amphitheatre on Friday 12th April 2019! The two hip hop artists, who have both collaborated with huge names (Childish Gambino, Billie Eilish, Mike Posner, Linkin Park, Pharrell Williams, G-Eazy, Miley Cyrus, Kehlani, G-Eazy, Chance the Rapper, Miguel, MadeinTYO, Yuna, Lil Yachty, Wiz Khalifa, 2 Chainz, Ty Dolla Sign and more), will be laying down a full set each at this unmissable event! Blackbear is an American hip-hop recording artist, singer, songwriter, and record producer who began his career in 2006 as the lead singer of Florida-based rock band Polaroid. After a few years with the band, Blackbear left to embark on a solo career and began working with singer, songwriter and record producer Ne-Yo upon moving to Atlanta, Georgia. He released his debut EP, Brightness, in 2008, and followed with Contrast (2009), and Exposure (2010). In 2012, Blackbear had his first hit when the Justin Bieber song “Boyfriend”, which he co-wrote, reached number two on the Billboard Hot 100. His first two albums, Deadroses and Help, were self-released in 2015, followed by 2017's Digital Druglord and a mixtape, Cybersex (2017) – his latest release.